In the deep stillness of the early morning in Shree Muktananda Ashram, thick mist hung close to the tops of the trees. The moon, which was waxing toward fullness and eighty-eight percent there, had set around 3 a.m. A soft, silvery light shone on the eastern horizon and the air was pleasantly cool. The first birds heralded the imminent sunrise, their love songs adorning nature. In India, the early morning time is called brahma muhurta, the “time of Brahma,” the Creator’s hour. 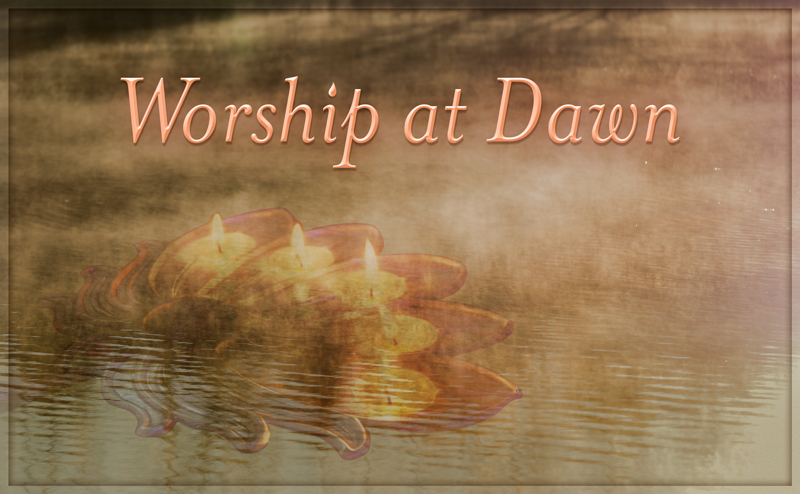 The Indian scriptures say that this is the most auspicious time of day for performing worship. In temples, priests and devotees prepare for worship by cleaning the arati trays, lighting incense, gathering fresh flowers, and making garlands from them. They make manifest an environment of sanctity and beauty. Soon, more devotees begin to gather in the temples. They watch, in anticipation, as the priests open up the doors to the inner sanctum while reciting sacred mantras. At any moment, the first glance of the deity will fall upon them! In this way, everyone participates as the deity wakes up to a new day, and they receive the deity’s grace and blessings. In the silence of the early morning, as the bells chime and the conch rings out, as the sound of mantras floats through the air, devotees can feel it: the stirrings of the universe, coming into existence yet again. On this splendid day, June 24, in the Temple in Shree Muktananda Ashram, Bade Baba was looking resplendent in robes of golden yellow. He wore a garland of white lilies and orange roses, and a magnificent mala, made of layered strands of deep red beads, rested against his robes—a striking juxtaposition of ruby and gold hues. Ruby was chosen to evoke Gurumayi’s Message Artwork for 2018; the center of the yantra in this artwork is studded with a ruby, representing Surya Devata, lord of the sun. Bade Baba’s pedestal was bedecked with roses in shades of ruby and many other beautiful colors, as well as with fragrant mogra and gardenia flowers. To behold such a sight, to perceive such beauty, to be ensconced in such silence, to experience such abundance within and without—this was a moment of satsang with Bade Baba. It was an experience of Gurumayi’s Message for 2018. Soon after the worship of Bade Baba, recitation of Shri Guru Gita was held in Shri Nilaya hall. Outside, the sun, Surya Devata, could be seen peeking through the clouds that were blanketing the sky. Shri Guru Gita, the “Song of the Guru,” has been recited in Siddha Yoga Ashrams and meditation centers, and in Siddha Yogis’ homes and offices, around the world since 1972. It was in that year that Gurumayi’s Guru, Baba Muktananda, first introduced it as part of the Ashram Daily Schedule. Each stanza of this sacred text reveals the knowledge and the light of the Guru, and elucidates the nature of the Guru-disciple relationship. Over the years, Gurumayi has taught seekers to create an intention before the recitation of Shri Guru Gita. This is a very powerful practice. There are blessings inherent in each syllable of these mantras. Therefore, when people recite them, they invoke these blessings, and the intentions they set come to fruition. It is essential to understand that the intentions we create must be benevolent in nature; they must foster goodwill. Through the practice of reciting Shri Guru Gita with such an intention, the lives of thousands of people have been and continue to be transformed; they are uplifted. On this blessed day, June 24, all of the participants must have made the intention for Gurumayi to have the best birthday. Seriously—the very best birthday! For as they recited each verse of Shri Guru Gita, there was palpable sweetness that continued to build and hover in the air. Unconditional love for Gurumayi was evident in the hall. Thank you for this beautiful account of Gurumayi’s birthday celebration! Reading it has confirmed for me the close connection among all Siddha Yogis around the world. The celebration in Shree Muktananda Ashram reflects what happened on Gurumayi’s birthday in the local center and in my heart: Gurumayi’s love for all of us was so tangible that we were all smiling broadly, and laughing too, like children invited to our own birthday party! We were filled with gratitude for the many gifts she is giving us, day after day. I was also inspired by the Siddha Yogis chanting the sacred syllables of Shri Guru Gita and infusing them with the power of their sweet intention. I realized that by following the teachings of our Beloved, we honor the immense grace we receive and in turn become better able to contribute to the world we live in! Reading this account made me feel like I was celebrating Gurumayi's birthday in Shree Muktananda Ashram. I love how the account begins with the Morning Arati at Bade Baba’s temple, like a yajna begins with the worship of the elephant-god Ganesh. As I read through the account, I realized that, by asking everyone to write about the day, Gurumayi not only invited those who were there to relive those beautiful moments, but also offered everyone else the opportunity to feel included and partake in the experience. What a beautiful teaching about giving and receiving. Thank you, Gurumayi, for this amazing blessing!